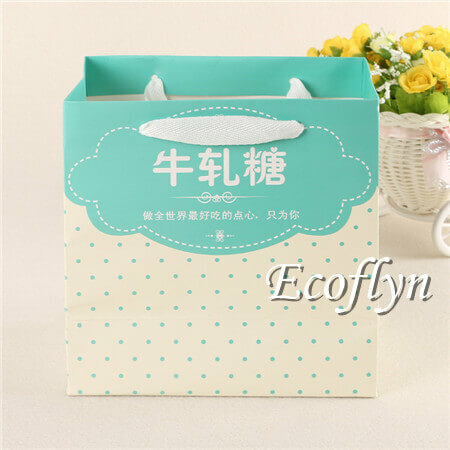 Paper gift bags are used widely in our daily life such as shopping bags for retails store, decorative gift bags for parties or holiday, wedding welcome bags, wine tote bags for celebrations… And I really would like to introduce to you our brand new 4 styles small gift bags in bulk which you may like. In fact, paper gift bags are occurring much more times in our life since retail stores move away from traditional plastic bags and toward friendly paper bags. Furthermore, gift bags and shopping bags covers nearly 68% of all paper packaging bags. And I’d like to show you 4 types of widely-used bags today. 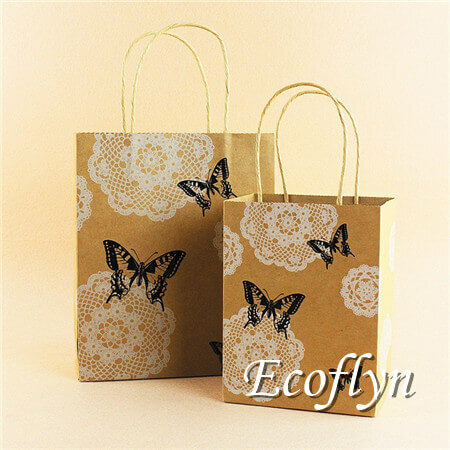 Here, easily find custom gift bags wholesale at Ecoflyn- a China paper bags supplier. Most bags are in stock, low moq&fast delivery, get one sample or custom it simply TODAY! 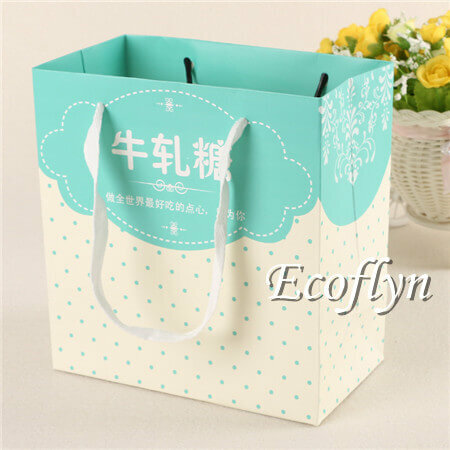 Kraft Handle Bags are always one of our best choices among paper gift bags when wrapping food, drink, small items…… And double-layer kraft make bags stand more weight than usual. 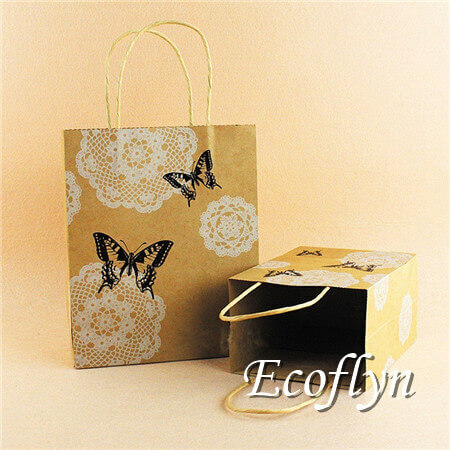 Check our this type of mini kraft gift bags. It’s made out of 180GSM kraft material and size is 18*12*26cm. ( size & color can be customized depends on your demands) There are white flour print and black butterfly print in the bags as you can easily see from the pic left. It’s very suitable to wrap & carry small gift items for parties or some celebration events as its elegant design and cute size. Sure, we can have the bag in absolutely plain then adding your own design. The handles are with the twisted handles glued firmly, of course, you can choose other handles like rope handles, fabric handles in any color to make the bags match your party theme accordingly. Bring guests a deep impression via these custom gift bags with your special ideas. 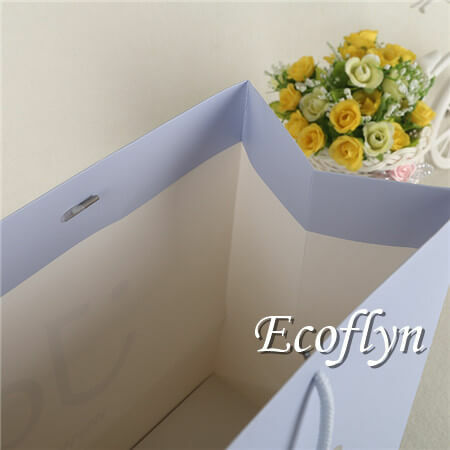 The paper gift bags shopping bags are lower in price. They come in many different appealing colors. With twisted handles, making them actually easy to carry. More, they are durable and allow re-use and recycling, could vary in sizes and shape thus great for user’s choice. 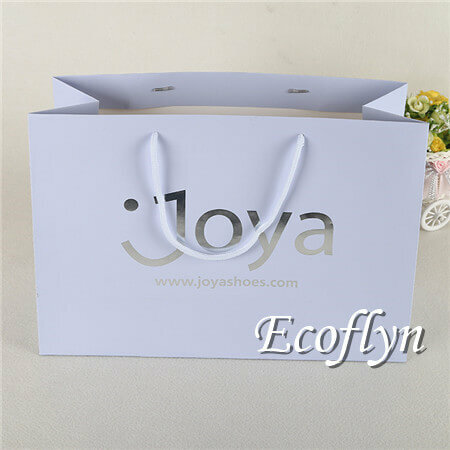 You can easily have the purple paper bags with your logo design to help customers keep your brand in their minds anytime. The bags are made out of white cardboard with rope handles. 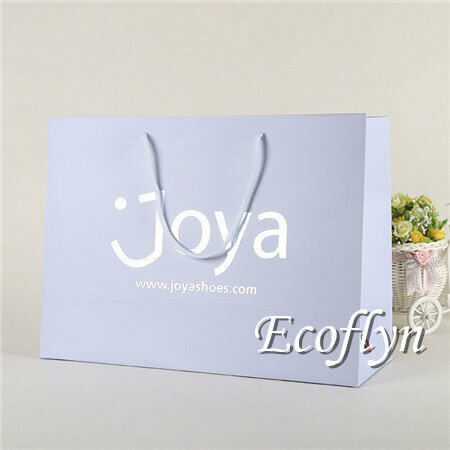 Light purple coat outside makes it looks very elegant and suitable to wrap & carry gift for lovers. Rope handles is also in light purple to match the bag’s body. Sure, you can change the handles to other choice like fabric handles, ribbon handles in any color according to your theme. See, the bags are with hot stamping silver design in front. Adding your brand logo and contact in the bags will help boost your brand awareness to your customers and let them reach you easily. Furthermore, this type bag is also suitable to warp&carry high-class women garment in boutiques shops. Contact us, will offer you a perfect sample bag with your logo! Then how about the 3rd style? As you can see, there are always so many celebrating events and parties everyday everywhere. So there will be lots of little gifts you need to wrap. 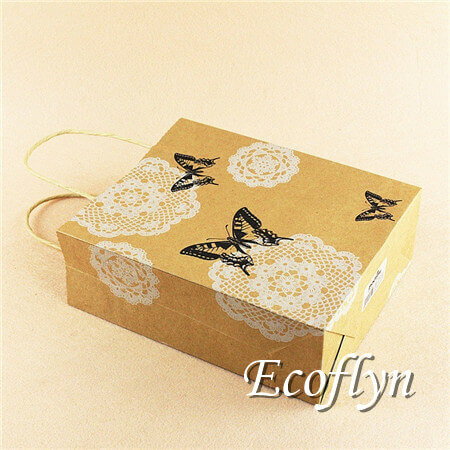 And decorative paper gift bags are widely-used during these celebrations because they are light to carry and not easy to wear out. Well, paper gift bags are a wonderful alternative to wrapping small gifts items as they are easy to use and can be reused several times. Gift bags usually require tissue paper, which is low cost and can add more color and individuality to the gift. What’s more, paper gift bags are a not-bad option for oddly shaped items, as long as they are not too heavy. 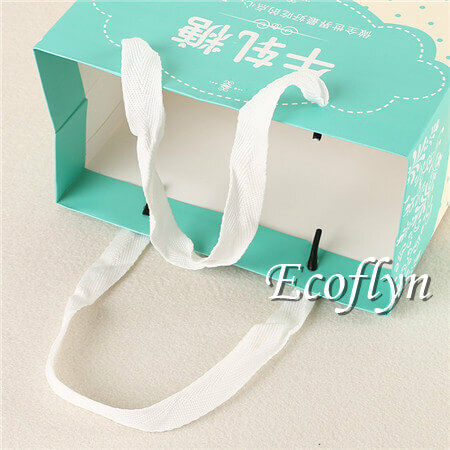 This type of small paper gift bags is very fittable to wrap small items like candies & sweets when parties or weddings. You can have the bride&groom’s name on the bags, then fill them with candies also colored tissues inside. 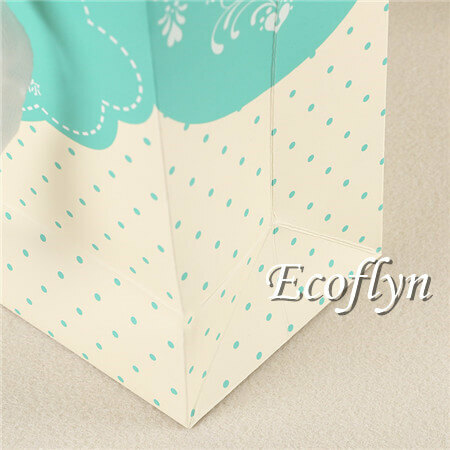 What’s more, the MOQ of this type mini gift bag is only 200pcs. We can mix them with a different design if you prefer small quantities as a trial order firstly. And with that, adding bride&groom’s wedding photo on the bag is surely no problem as long as you like. The tiny green polka dots printing is very simple but enough romantic, don’t you think so? Finally, about the handles, we can easily change original fabric handles to ribbon handles as you wish, also adding some ribbon bowknots can help boost more romantic moods.Get a bag belongs to you today! 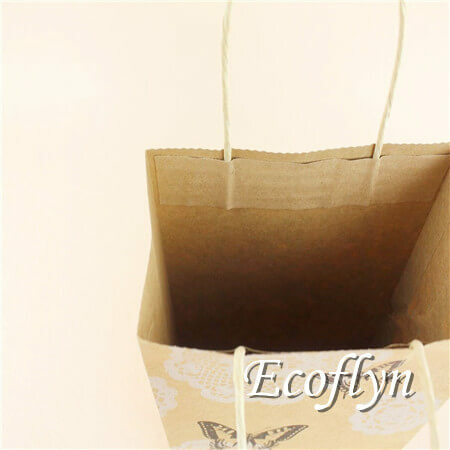 Are you looking for wine paper bags printed with your logo? For example, a promotional gift, or for your liquor store? We would like to help you. For example, a promotional gift, or for your liquor store? Find your perfect wine bottle gift handle bags at Ecoflyn. You can custom the bags in shape, print, size and colors. You can get it in only one piece or purchase them in bulk. The handles can be changed into a ribbon or other material available. Black paperboard and they are finished with a glossy lamination. Wine paper gift bag made of cardboard paper in black background in various colors print with rope handle. 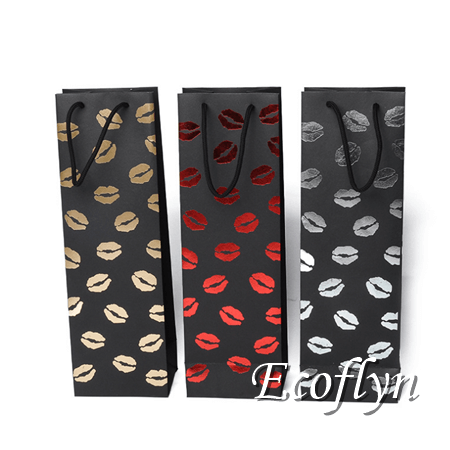 The wine bottle paper bags is with hot stamping lips print, making this type wine handle bags pretty suitable to wrap gifts for lovers when Valentine’s Day. Handles are black rope handles but we can change it into ribbon handles special for you. Generally, hot stamping color could be gold, silver, red, of course, we are able to add any other colors appointed by you. 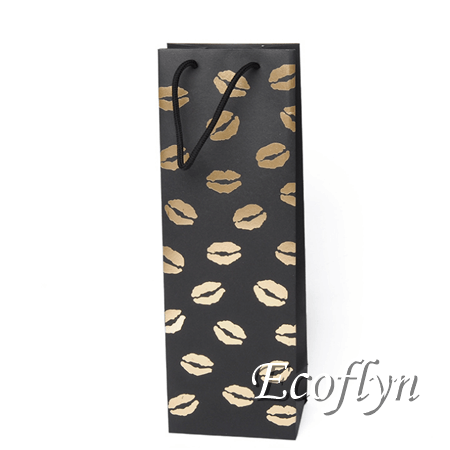 What’s more, the standard size for a single wine bottle bag is 9*9.5*35cm, anyhow, we can have them in any size according to your request. Feel any interest in these bags? Now it’s your turn. 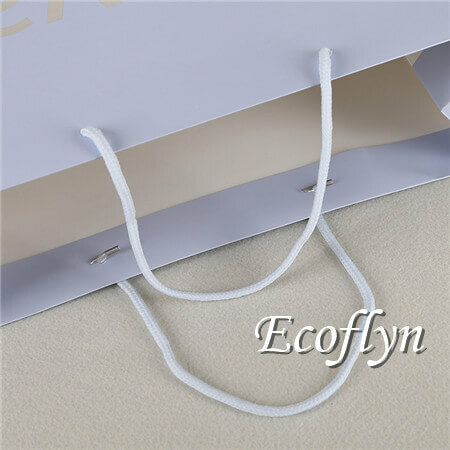 Leave a comment below sharing with us the idea in your minds or visit our site to explore more trendy mini gift bags with handles at Ecoflyn- a China paper bags with handles wholesale supplier. We will evaluate all the comments frequently and choose the best one(which provide the good idea and great value to us and other readers), then offer that reader a free sample. Don’t mean your wonderful ideas, meet your more friends here.